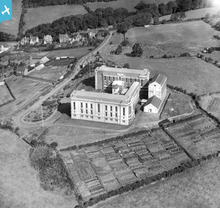 Very different now, more "castle" now than then! [WPW040030] Distant view of Aberystwyth, oblique aerial view. 5"x4" black and white glass plate negative. 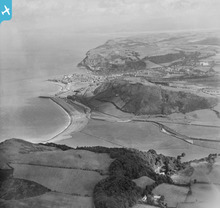 See how small Aberystwyth was in the 1930's, as opposed to now! Photo focuses just on one building, yet so much has changed. Amazing photo, I was reading at Aberystwyth University two years ago, and used the National Library quite a lot. It must have been even more imposing with all the space around it then. We lived and worked in Ceredigion (Lampeter, Aberystwyth, Cardigan) for many years before moving to France to retire only to find that the rainfall here is about the same as it was in Cellan and quite a bit colder in the winter too!